Meeting new food aficionados is always a pleasurable experience and I constantly have this opportunity whenever I visit. Meetups become regular now days! Well, FBAB or Food Bloggers Association, Bangalore along with Mr. Anurag Sharma organized their 2nd Meet at Wareabouts Grill and Lounge in Marathahalli. 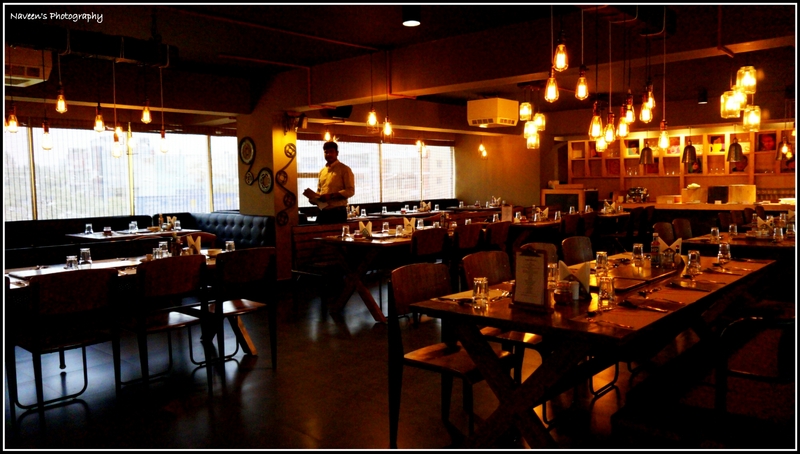 The restaurant is located on the 3rd floor and lounge on the 4th floor, which is a breathtaking rooftop with a view of Ring Road. I was the first one to walk inside and got an opportunity to visit every corner of the restaurant with one of the partners who is again a foodie and member of FBAB. He is the one behind the scenes of the best décor at Wareabouts. The restaurant was welcoming with a lovely fragrance. I am fascinated with their décor at both restaurant and lounge. 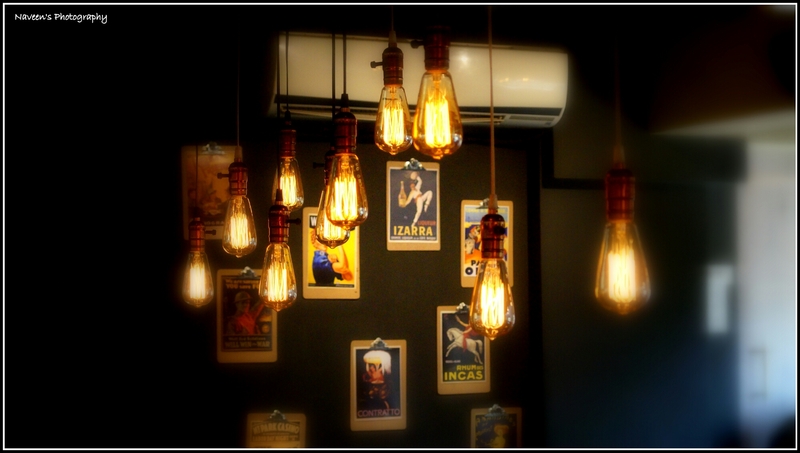 A Bunch of Multi Filament lamps dangling on every table is highlighted to the ambiance. 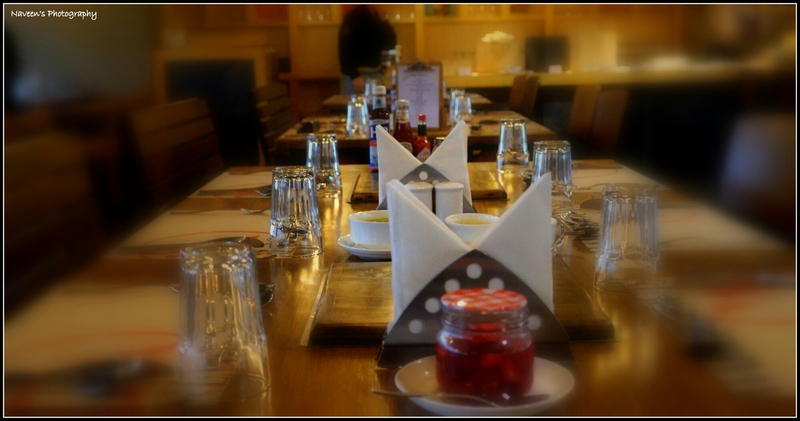 Customized Chairs and Grill on Tables are decorously arranged. Wooden Curtains for the windows gave an archetypal look to the complete dining area! Folks welcomed us with a glass of Mango Lassi, which was much desired for me after a long drive for about 20kms. It was terrific! After socializing with fellow foodies, we stirred on to live grilled starters (On Table Grill) like paneer, Mushroom, Sweet Potato, Broccoli, Zucchini and Brussels Sprout. I utterly enjoyed all the starters on Grills and off the grill. They served some crispy corns, Honey Glazed Pineapple and Veg Cutlet which are again splendid in one word. Followed by Starters, there were some signature main course dishes like Gutti Vankaya Kura, Onion & Mint Pulao, Chicken Murg Biryani, and Raju Crab Gravy! Their buffet spread is simply superb with limited dishes. They gave a touch of Andhra Style by adding few dishes to their buffet menu which is praiseworthy. Desserts attracted me badly; they had Indian Desserts at the spread which includes Apple Jalebi, Mint Rasgulla, Mango Mousse, Black Forest, Assorted Cut Fruits, Gulab Jamoon, Malpua and Rabdi! I was flabbergasted with the taste of these! My Special thanks to Chef Pritam Das and Mr. Anurag Mishra on behalf of complete #FBAB Members for such a great host! You guys really made our day with pioneering food and best in class hospitality. I strongly endorse this place for lunch & dinner! Address: 90/1B, 3rd and 4th Floor, Kings Cross Building, Innovative Multiplex, Outer Ring Road, Marathahalli, Bangalore 560037. Note: This write-up is based on Vegetarian Prospective.